Kala Pattar is a small peak literally meaning "black rock". Its altitude is generally given as 5550m but it seems to be a little higher (5570m or 5580m ?) if you go as far up as possible. Kala Pattar is located right at the foot of Pumori (7161m) and above Gorakshep on the way to Everest Base Camp. Many trekkers to Everest Base Camp will attempt to summit Kala Pattar since it provides the most accessible point to view Mt. 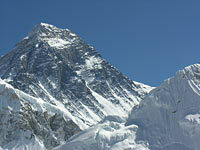 Everest from base camp and all the way to its summit (the summit of Everest cannot be seen from its base camp). 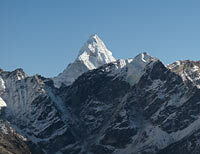 The views from almost anywhere on Kala Pattar of Everest, Lhotse and Nuptse are spectacular. Kala Pattar is also popular because it is one of the highest point that can easily be reached (on popular treks in Nepal) without any mountaineering experience or equipment. 'Easily' might be a little misleading though: the walk from Gorakshep is an easy uphill (you do not see the real top from Gorakshep, it is actually quite a bit higher than the visible hill) walk IF YOU ARE WELL ACCLIMATISED. If you are not (and most people who only trek to Everest Base Camp and back within a limited amount of time are not well acclimatised) it is a hard trudge that will leave you breathless and struggling physically and mentally. Still, take it easy and it will be really worth it. Be prepared to share the walk (and the summit) with lots of other trekkers if you go there in the main trekking season: it is a popular destination. I have seen many people climb up the hill at dawn. There are no real advantages to it as the sun rises behind Everest, Lhotse and Nuptse so you won't have any good light (but you'll get very cold if the wind is blowing). A much better time to go to Kala Pattar is in the afternoon and if you can (and the weather allows), wait for the sunset there: the light on the mountains is simply amazing. Unfortunately, the clouds often come up from the valley in the afternoon and mask the view so it is not always an option. If you only have one day to go up to Kala Pattar then go in late morning, it won't be too cold, the light will be OK and the clouds won't have come up from the valley yet. 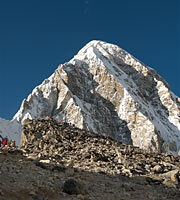 The ascent of Kala Patthar begins at Gorakshep (5,164m), the original base camp for Mt. Everest. After a brief dip to an ancient lake bed (which now contains a small lake and a helipad and is often called "The beach"), the ascent makes its way up a series of steep switchbacks before levelling off somewhat as it traverses to the eastern side of the mountain. The trail then becomes steep once again until it reaches the wind-swept summit ridge. 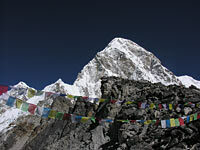 From there, a five to ten minute scramble over boulders takes one to the top, which is marked with prayer flags. The full ascent usually takes between 1.5 and 2 hours. go slowly unless you are well acclimatised. You will enjoy it much more if you don't go too fast. A roughly 300° panorama taken on the way up to Kala Pattar. Pumori is in the far left, Everest and Nuptse in the centre, Lobuche in the far right. A roughly 180° panorama taken on the way up to Kala Pattar. Everest Base Camp on the left, Ama Dablam towards the right.